Estelle Getty may not be dead... Keep your fingers crossed. The youngest Golden Girl has died. 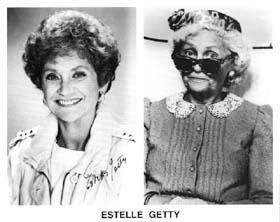 That's right while her character was older than all the other characters Estelle Getty in real life was 57 years younger than Bea Arthur. She died this past week in her 30's. Sometimes death hits like a ton of bricks this is just one of those losses I believe we'll be realing from as a nation for some time. The Emmys later this week will likely honor Miss Getty with a tribute helmed by television's Andy Richter and the cast of Bring In Da Noise Brin In Da Funk. Used to be the craziest thing R Kelly'd ever done was peeing on a 14 year old on video. Not true these days as R Kelly has created the great musical theater piece of our time "Trapped In The Closet." At the VMAs last night he performed a new chapter "Playing" all the parts himself. It looked like a Washington Square Park performance artist had gotten loose on the stage. Needless to say the poorly lip synched performance was the best piece of television to emerge from the show (perhaps ever). It was remarkable to watch as he argued with himself ("Rufus... Chris... Rufus... Chris") and he even got very Sean Penn and through a chair. Someone get this man to Broadway! 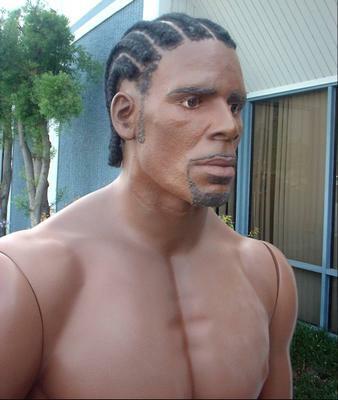 Below is R Kelly as large prosthetic statue. Each year at the Mtv Awards the network debuts new and exciting ad campaigns. This year was no different though the adds suggested Mtv is feeling the heat from Fuse. The network has pitched itself as "Musical Television," asserting that inspite of what everyone thinks is plainly apparent they play lots of music. It is an interesting business strategy. Not dissimilar to the disasterous "New Coke" experiment that failed in the 80's (and actually helped close the gap between Pepsi and Coke further). It seem Mtv is trying to assert it's Fuse-ness inspite of the fact that they command the youth television market far more effectivly than Fuse. If Mtv expects to be more successful by trying to be more like there number 2 competitor I think it's a dumb move. But what do I know I just really like TV.